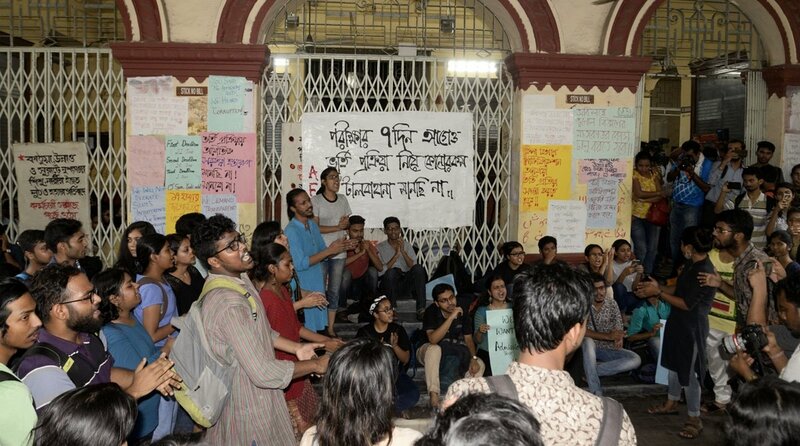 Students protesting against Jadavpur University’s 4 July decision to scrap admission tests for undergraduate courses in six humanities subjects finally ended their siege of Jadavpur University Vice-Chancellor Suranjan Das and other executive council members around Thursday midnight and allowed them to go home. After keeping him confined to his office for 31 years, the students allowed Das to leave after giving him a deadline till 5 pm, Friday, to roll back the decision. “We have allowed him to go. We have given them (the university authorities) time till Friday, 3 pm, to roll back the July 4 decision and implement the EC’s June 27 decision to prepare the merit list for admission based on equal weightage to admission test and marks obtained in the previous board examination,” one of the protesting students, Debraj Koley, told IANS. He said the students would come up with some novel forms of protest if the authorities did not yield to their demand. Earlier, speaking to the media in his room, Das called the protest “inhuman” but said he would not call the police. “I have a number of ailments, but they are not allowing me to follow the protocols suggested by my doctors. My health is getting affected. In the name of launching a democratic moment they are infringing on our right to spend a normal life with our family. “The decision has been taken by the majority of executive council members. I am bound to abide by that as per university rules. What could I have done? “But I will never call the police. I will hope good sense prevails,” he told mediapersons at his room. Meanwhile, a section of English department teachers have decided to stay away from the entire admission process, protesting against the “insult” and “humiliation” meted out to them by the authorities. The Jadavpur University Teachers’ Association has decided to hold a ceasework on Friday. In a major decision, the JU authorities had on Wednesday said it was doing away with the decades-old system of holding entrance tests for admission to six under-graduate courses. The decision immediately triggered protests from students and teachers, both present and former. A week earlier, the executive council had said admission tests would be held for six departments of the humanities stream — comparative literature, history, political science, philosophy, English and Bengali. But it had also declared that equal weightage would be given to marks and the test while preparing the merit list. However, on Wednesday, the it passed a resolution withdrawing the notification issued earlier for admission tests and said “under-graduate admission in arts should be conducted on the basis of marks obtained in the last board examination alone, without conducting any written admission test”. The council said the decision had been taken for the coming academic year “in order to address the impasse created by legal questions regarding the process, and not to inconvenience the thousands of applicants awaiting certainty regarding the admission process”. Soon after the decision, students began an impromptu sit-in demonstration in front of Aurobindo Bhavan, the university’s administrative headquarters, and confined the V-C to his room. The executive council decision came in the backdrop of Education Minister Partha Chatterjee speaking out on several occasion against the JU holding admission tests for UG courses in some subjects but allowing admissions in some other courses on the basis of plus two results. Earlier, Jadavpur University had witnessed an uproar following the decision to take the services of “external experts” in preparing one of the two sets of question papers for the admission tests, and the opinion of the advocate general that the Board of Studies has no role to play in the admission process.